For a few years now, I highlight one photo each month as “The Photo of the Month.” It typically features one of my favorite shots or one that stands out in some way above the others. This concept gained some momentum even among the players I photograph. Some of them even mention one of their goals is to be featured in my photo of the month! I enjoy getting to know these athletes both on the field and the sidelines. They are real people who do some amazing things that I am fortunate to capture with my camera. 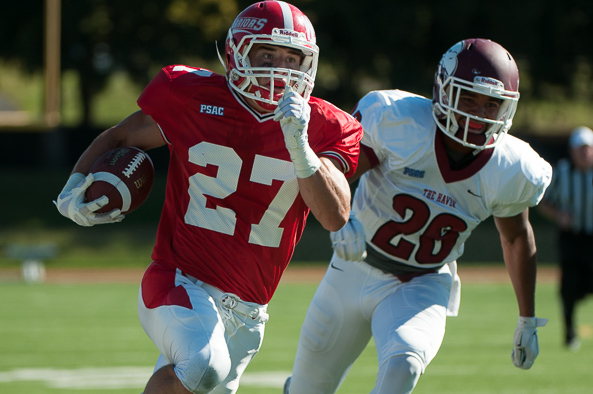 This month’s photo of the month was captured at an East Stroudsburg University football game. It includes some of the goals I aim for in sports photography. You can see the description of this photo here. At the beginning of each month I enjoy going back over the photos from the previous month. My goal is to pick the best photograph or moment captured with my camera to display as “The Photo of the Month.” Sometimes the competition is stiff. Other times, one photograph stands out easily above the rest. September’s Photo of the Month was likely to be a football photograph. For one thing, this is the time of year for football. After all, is there any better season than fall, and is there any better season than football season? I think not! We are definitely in the midst of football season! It is incredible to me, but I still find myself getting butterflies on Friday nights before the games. I certainly did when I played high school football back in the early ’80s, but even now, as I am preparing to photograph a game, I find myself pacing back and forth a little bit and fighting off those nervous butterflies that fly around inside my stomach. Will I capture the moment at the exact right time with my camera? Will the photo be in focus? Will the referee run between my camera and the play? Yep, butterflies are still there flying all around in my stomach. There isn’t a feeling in the world to match it! Some of my goals for a good, quality football photograph include: 1) the face should be showing in the frame and hopefully the eyes will be visible, 2) the ball should appear in the frame, 3) a special moment or peak action should be captured. This photograph accomplishes all three of these goals. It was a special moment in time captured by a camera so it can be recorded for all time. This to me, is the goal of good, quality photography. It is a worthy pursuit and it keeps me coming back time after time to the field to try to capture another special moment. The next day, this photo ran six columns wide in the sports section of the Pocono Record. You can view this new Photo of the Month and previous ones here. 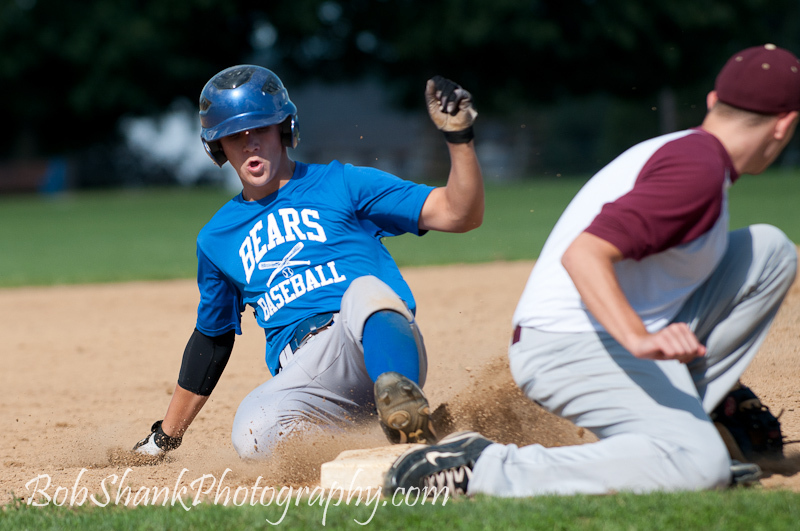 I posted the most recent Photo of the Month on my Perfect Game Photos website. 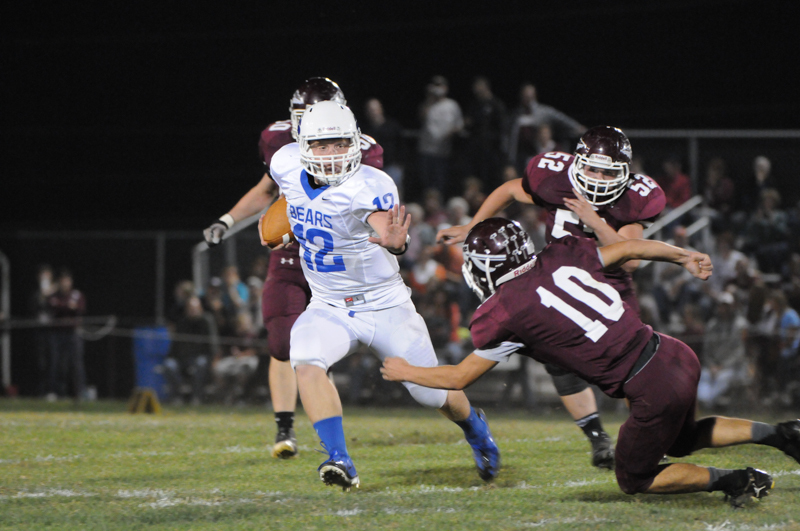 This monthly feature shows a sports photograph that I like with a story behind it. I simply show a photo and then add some text to help tell the story why this particular photograph made the cut. It is a feature I enjoy including on my sports site and I find it encourages me to keep trying for better photographs month after month. You can see more of my sports portfolio here. 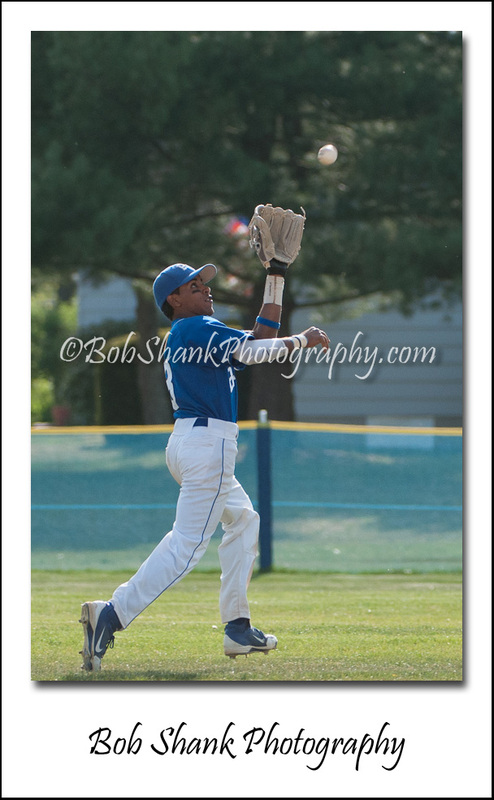 Now that May is over, I posted a new Photo of the Month on my Perfect Game Photos website. Each month I sift through all my sports photos and present one of the best as the Photo of the Month. I then post the photo on the website and add a description about the photograph. 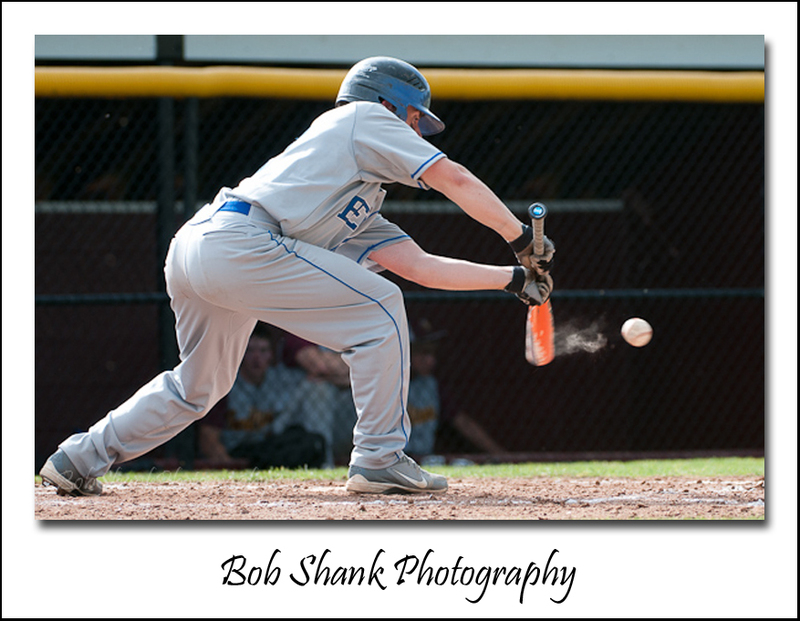 This past month’s photograph is Pleasant Valley baseball player, Howie Stevens, laying down a bunt. Bunting might seem rather mundane and unexciting, but look at the action in this photograph. The dust cloud coming off the bat dispels the rumor that bunting is boring. 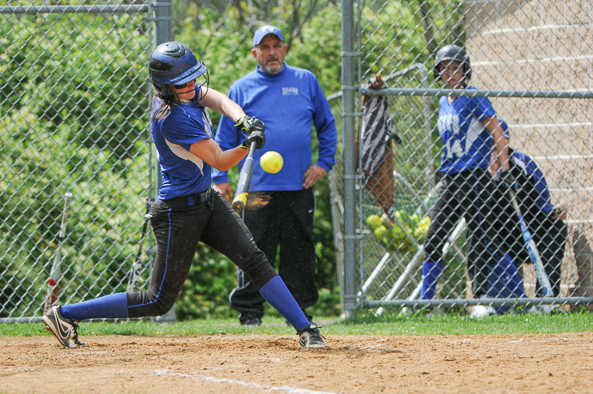 I believe the photo shows the drama and excitement in the ordinary bunt. What do you think? This photo is the running! Each month I select my best shot of the month and give it the honor of “Photo of the Month” on my all-sports website, Perfect Game Photos. Last month was easy because I captured a bat breaking as it was swung at and hit a baseball. I always try to get the ball in the frame because it shows the intensity and action of the game. 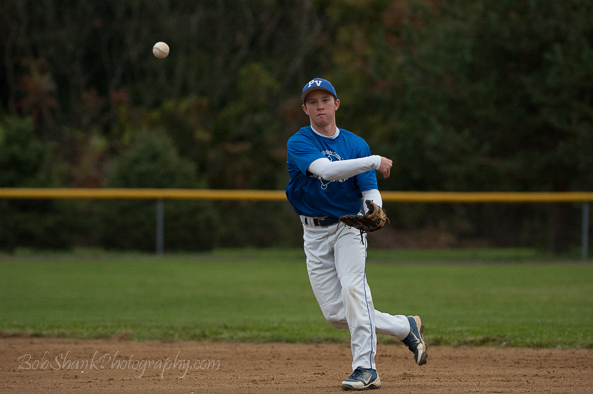 This photograph I captured today shows the second baseman’s eyes focusing on the baseball as he is tracking down the ball to catch in his glove. One of the player’s feet are in the air as he is running it down. I love the action of this shot! I am picky though and there is one bad part to this image and that is the background. There was a house behind the field and it usually shows up at the exact wrong time in an otherwise great photograph. Still, this is a quality shot and is now in the running for the honored spot for the month of April. Each month I pick a “Photo of the Month” to display on my all-baseball website: Perfect Game Photos. The idea is to feature my favorite peak action photograph in a given month. Sometimes this is easy because a cool photograph sticks in my mind. Oftentimes, however, I have a difficult time narrowing down the choices to just one. There can be a lot of good photos taken at one game let alone in one month! I am getting better in my sports photography skills and I am becoming more consistent in getting the peak action.